Considering what you would pay for hosting per year at most places; and the software you would have to by; and the knowledge you would have to have for FTP transfers to the host; and the top notch support @ Yola.com, the $20 domain registration per year is the best value on the internet. Yola is the best investment you can make for your business; and if you would rather have someone else build it for you, http://greyeyesgabrielinternational.com is here to assist you in your web needs. Build packages will be released later this week and will include, a basic Yola platform website with domain registration & link banner removed; at additional charge you can add a basic social network built on the Ning platform with additional features extra; and additional paid features widgets hosted on your website listed in the Widgetbox gallery that links to your website, or social network. All packages will be detailed @ our website http://greyeyesgabrielinternational.com and will be announced in our blog http://greyeyesgabrielinternational.b... as well as @ our support community http://getsatisfaction.com/greyeyesga.... Your one stop web 2.0 solution is @ greyeyesgabriel international. Thank you for providing your valuable product to us @ http://www.Yola.com you are the best! Link back aside it still is an infringement or alteration of a respected trademark which has implications in itself and I was pointing out that you might wish to rethink the editing of the logo as they have in the past had issue with others that did so. Yours may very well be innocent but it directly goes against the previously stated TOS. I think that you are misinterpreting that which was stated by Monique as to the image you presented to her in that thread. It appears that you altered the image after you posted and that is the issue I see and not that you asked for permission and was granted it but used permission then changed it after. Here is an alternate to editing the image. Become a Commission Junction affiliate and place a banner on your site which earns you money instead. Apparently you missed my last post; I am now a Yola affiliate and have a link banner; CJ is one of my favorite affiliate companies, kind of like I can see the future, huh? LOL... Why are you so offended? Thanks for the advertising, though. Wouldn't it be funny if there were a feature or social network that ended up with that same logo; sponsored by Yola of course...gee, it sure is a cute logo, even if I do say so myself. 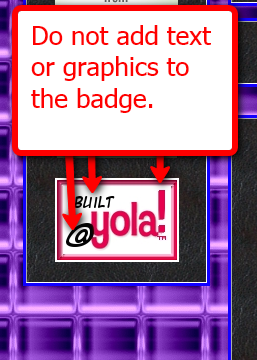 Wouldn't it be cool to have a free feature that showcased your @Yola! built websites? A website that showcased the talent @Yola!, connected with a social network that would allow Yola designers and clients to get to know each other and add to the web 2.0 strength in the search engines; that type of improvement to Yola could move their ranking up into the top 100...so what do you think? Why not tell Yola that you would like to see greyeyesgabriel @Yola! idea implemented into the company...I don't see how anyone could not like the idea. I have submitted this idea and transferred further discussion of it to a new thread; come read about an idea for a new feature Yola; The @Yola! Network, and let Yola as well as myself know what you think about it. P.S. my opening link on my company website says Get Noticed... do you see me? 1. Jealous that they aren't free features. I need a review as I am building a website trying to attract western English speaking people. But as a foreigner it always seemed a bit difficult. I need a professional pair of eyes to tell me how to change the layout or color themes to suit western tastes. I am building it so hard including building paypal shopping cart buttons to all the products.